Le blogue du Département de criminologie publie à l’occasion des billets d’étudiant(e)s sur leurs activités scolaires. Janie Beriault Therrien (finissante au Bacc. approfondi en criminologie) a lancé une campagne de sensibilisation sur la surconsommation de plastique dans le cadre du cours CRM4310 Exercising Leadership. Dans ce billet, elle explique sa démarche et fait la promotion de sa campagne. Every month, the Blog of the Department of Criminology publishes essays written by our colleagues featuring their research or their analysis of current issues. In this essay, Baljit Nagra (Assistant Professor) offers her analysis of Quebec’s Bill 21. To read this essay, click on the link below. Le CRSH vient d’annoncer les récipiendaires des Subventions Savoir et des Subventions d’engagement partenarial. Plusieurs collègues du département sont parmi eux! SSHRC recently released the name of the successful applicant for its Insight Grants and its Partnership Engage Grants. Some of our colleagues are among them! Richard Dubé (Professeur agrégé) et Margarida Garcia (Professeure agrégée) ont obtenu une Subvention Savoir pour leur projet L’influence des victimes, des notions de reconnaissance et de dignité dans l’élaboration des politiques pénales et la détermination de la peine. Jennifer Kilty (Associate Professor), Michael Orsini (Full Professor in Political Studies), Justin Piché (Associate Professor) and Prashan Ranasinghe (Associate Professor) received an Insight Grant for their research project titled Feeling the Carceral, a carceral geographic analysis of the relationships between emotions, space, and carcerality. Justin Piché (Associate Professor), Kevin Walby (Associate Professor, Criminal Justice, UWinnipeg) and Carolyn Côté-Lussier (Assistant Professor) got a Partnership Engage Grant for the project Making Meaning Out of Punishment: Exhibit Curation, Tour Guide Work and Visitor Engagement at the Ottawa Jail Hostel. The partnership will involve conducting archival and document research, and filming interviews with former local prisoners and jail staff from the Carleton County Gaol and the Ottawa-Carleton Detention Centre, to co-create a new tour script and exhibits to be shared with hostel guests. Gina Wilson (alumna, Criminology) has been appointed Deputy Minister of Public Safety. She began her career in her Algonquin community of Kitigan-Zibi as Executive Director of Health and Social Services and as Director of the Wanaki Treatment Centre. She then moved one to occupy positions as a senior manager with the Assembly of First Nations, Director General of Engagement at the Privy Council Office, Assistant Deputy Minister with Indian Residential Schools Resolution Canada, and Assistant Deputy Minister of Emergency Management and Regional Operations at Public Safety Canada. Since last year, she was Deputy Minister of Status of Women Canada. Eduardo González Castillo (Professeur adjoint), David Moffette (Professeur adjoint) et Baljit Nagra (Professeure adjointe) font partie des 250 universitaires qui ont signé une lettre ouverte publiée dans le quotidien Le Devoir s’opposant au projet de loi 21 interdisant le port de signes religieux au Québec. La lettre est une initiative de l’Observatoire international sur le racisme et les discriminations. Pour le billet, cliquez sur le lien ci-bas. Members of the Criminalization and Punishment Education Project (CPEP), which conducts research and advocacy aimed at reducing imprisonment and improve conditions of confinement, have published two new op-eds. Contributing to the work of the #NOPE / No Ottawa Prison Expansion campaign, Justin Piché (Associate Professor, Criminology, uOttawa) published a piece that appeared in Rabble last week entitled “Ontario’s kids need more education today, not more cages tomorrow”. The piece locates the plan to build a new and bigger jail in Ottawa within broader provincial government restructuring that includes cuts to services such as education for young people. 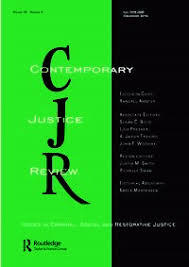 Carceral Cultures Research Initiative team members Justin Piché (Associate Professor, Criminology, uOttawa), Matthew Ferguson (PhD Student, Criminology, uOttawa) and Kevin Walby (Associate Professor, Criminal Justice, uWinnipeg) have published a new article in Volume 8 of the Annual Review of Interdisciplinary Justice Research. Entitled “A ‘win-win for everyone’ Except Prisoners: Kingston Penitentiary Tours as a Staff, Media and Public Relations Campaign”, the paper explores how Correctional Service Canada (CSC) planned tours of the notorious penitentiary as a means of neutralize criticism concerning its closure. The paper is the second open access publication produced by the Carceral Cultures team that contains hyperlinks to internal documents obtained from CSC using Access to Information requests that allows readers to consult materials that substantiate the authors’ claims and to use for their own research purposes (also see Shook et al., 2017). 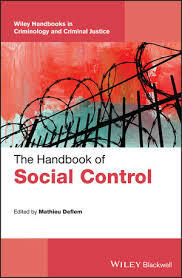 Building off of these, as well as other previous publications in Scapegoat: Architecture / Landscape / Political Economy (Ferguson et al., 2014) and Theoretical Criminology (Kleuskens et al., 2016), the research team continues to conduct research on CSC’s involvement in punishment memorialization work that legitimates the deprivation of liberty in the Canadian carceral state. In related news, doctoral student Matthew Ferguson successfully defended his comprehensive exam today entitled “Policing Memories and Memorialization in the Carceral State”. His research is helping to push the Carceral Cultures Research Initiative’s work on punishment memorialization beyond the confines of incarceration to examine the memory work concerning other penal system entities such as the public policeclick here to learn more). Congratulations Matthew! Photograph by Justin Piché (2013) at Kingston Penitentiary following its closure. 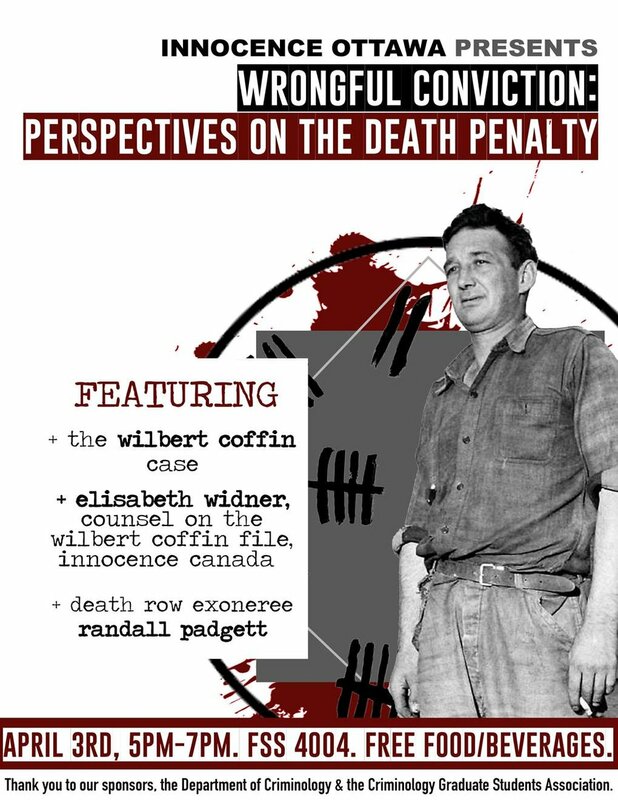 Innocence Ottawa, an organization that counts among its members Kathryn Campbell (Associate Professor) and various criminology students, is hosting a talk titled Wrongful Conviction: Perspectives on the Death Penalty. See the poster below for details. Dillon Black (PhD Candidate) was named one of Ottawa’s top 10 trailblazers 2019 by CBC Ottawa. The award was granted in recognition of their advocacy work on issues of gender-based violence and fighting for the rights of young women and LGBTQ2S+ youth. You can listen to an interview and read more about their work here. Vous êtes-vous déjà demandé ce que vos professeurs préférés veulent vraiment que vous retiriez de leurs cours et de votre expérience à l'Université d'Ottawa ? Rejoignez-nous le mercredi 27 mars 2019 à 16h au LMX 360 pour cette « dernière conférence » ! C'est l'occasion pour vous de poser vos dernières questions de l'année, de créer des réseaux et de développer une perspective que vos cours réguliers ne vous offriraient pas. C'est un événement gratuit et des rafraîchissements seront offerts! Have you ever wondered what some of your favourite professors really want you to be taking away from their lectures and your uOttawa experience? 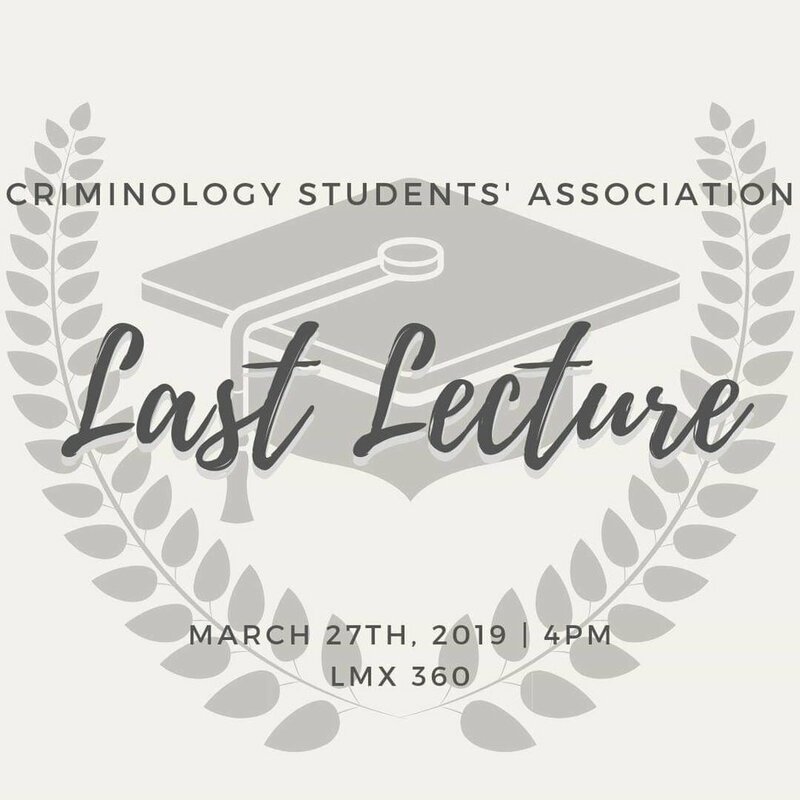 Join us on Wednesday, March 27th 2019 at 4pm in LMX 360 for Last Lecture! This is your opportunity to ask your final questions of the year, network, and gain insight you’re never going to get in your regular lectures. This is a free event and light refreshments will be offered! 3 months. 659 calls. 196 advocacy interventions. These are some of the numbers generated by the Criminalization and Punishment Education Project’s JAIL / Jail Accountability & Information Line since the hotline’s launch in December 2018. More important, however, are the stories and recommendations shared by Ottawa-Carleton Detention Centre prisoners with hotline volunteers over the past three months , which are included in the JAIL’s first quarterly report released today. As with the hotline’s report from its first month of operations, issues with medical and mental health care remain front-and-centre in the new report (click here to download), which has received media coverage in venues such as CFRA and 1310 News. With the volume of calls and the costs of running the JAIL hotline higher than anticipated, the Criminalization and Punishment Education Project is raising funds on an on-going basis to sustain the initiative. There are two ways you can help. 1) You can make a larger donations of $20 or more (and receive a tax receipt from uOttawa) by clicking here. Please make sure your donation is directed towards the "Faculty of Social Sciences Criminalization and Punishment Education Project Fund" under the designation field (which is listed directly under the Donation Amount section). 2) You can make smaller donations of $20 or less to a Go Fund Me page CPEP will be setting-up in the coming days. Les Presses de l’Université d’Ottawa viennent de publier leur plus récent catalogue. Parmi les ouvrages qui seront disponibles à partir de septembre, on retrouve la collection bilingue Danse, enfermement et corps résilients / Dance, Confinement and Resilient Bodies dirigée par Sylvie Frigon (Professeure titulaire). The SNC-Lavalin scandal has everyone talking about corruption and political responsibility. While these issues certainly matter, there is one topic that is absent from the discussion: that Canada is weak on corporate crime. This is what corporate crime specialist Steven Bittle (Associate Professor) argues in this op-ed for the Hill Times. Chaque mois, le blogue du Département de criminologie propose des billets rédigés par nos collègues et présentant leurs recherches ou leurs perspectives sur des enjeux d’actualité. Dans ce billet, Eduardo González Castillo décrit le projet de recherche “Service aux jeunes” (SAJ) auquel il participe. Line Beauchesne (Professeure titulaire) s’est entretenue pendant plus d’une heure avec l’animateur de L’informel, une émission de TVC. Ensemble, ils discutent de plusieurs thèmes liés aux drogues, à leur contrôle, et à la légalisation récente du cannabis. Vous pouvez regarder l’entrevue ici. Le Collectif de recherche sur les migrations et le racisme (COMIR), dont David Moffette (Professeur adjoint) et Baljit Nagra (Professeure adjointe) sont membres, organise plusieurs activités dans le cadre de la Semaine nationale du travail social. The Research Collective on Migration and Racism (COMIR), which counts David Moffette (Assistant Professor) and Baljit Nagra (Assistant Professor) among its members, is organizing several events as part of the Semaine nationale du travail social. Journée d’étude "Direction de thèse, supervision de doctorant.e.s : enjeux et contextes de l’encadrement aux cycles supérieurs"
Michèle Diotte (Doctorante) est co-organisatrice d’une journée d’étude intitulée « Direction de thèse, supervision de doctorant.e.s : enjeux et contextes de l’encadrement aux cycles supérieurs ». Cette journée s’adresse au corps professoral et aux étudiant.e.s aux cycles supérieurs. La journée est organisée par le GT18 (Devenir et être sociologue/AISLF) et le Centre interdisciplinaire de recherche sur la citoyenneté et les minorités (CIRCEM). Pour vous inscrire, veuillez écrire à l’adresse suivante et mentionner votre nom, votre statut et votre affiliation. Veuillez également indiquer si vous souhaitez participer à la journée entière ou à certaines activités uniquement (cela nous permettra notamment de mieux prévoir l’organisation du repas du midi et de l’activité de présentation des livres). Vous serez ajouté à l’infolettre du CIRCEM.